Hi again! 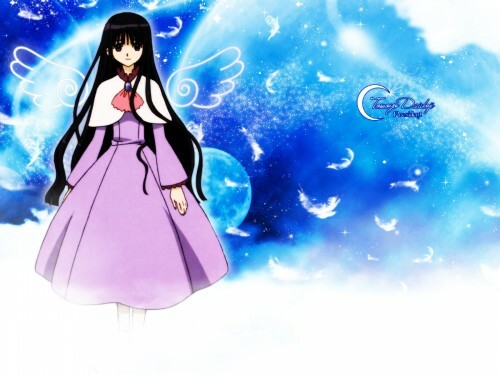 This is my recent wallpaper of Tomoyo Daidoji. Thanks so much! I really like Tomoyo in the Tsubasa chronicle version. It just makes her more cute, don't ya think (especally in the manga) The background is nie too. Like the moon and clouds! Thanks again! i luv this pic becuz of the contradictions. her hair style makes her such a mysterious person yet the bg seems like heaven making her angel-ish. my fav part of this wallie is the bg color and the fx too. great pic! waiii, it's tomoyo! she is so cool in Tsubasa! who'd have thought she would look so totally competent with a gun in hand and dressed in a stylish outfit? ;) thanks for the wallie! it lloks so serene...Thanks for sharing!